I don’t know anything about the process which Kadaver and Djinn went through in order to create this album, and it doesn’t really matter. 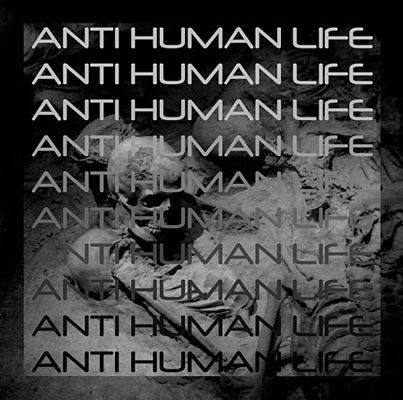 Anti human life is not a simple split between the two hostile artists, and instead it sounds like a thoughtful collaboration between the two. The arrangement of the order of the tracks, one by Kadaver, one by Djinn and so on, magnified by the fact that these tracks merge together so easily, indeed makes hard evidence for this assumption. What we get is a cold, disturbing and painful death ambient odyssey, which shouldn’t be a surprise to anyone resourceful enough to read the titles of the track. Each of these titles smells of death and decay, and even the almost naïve title for track number six, “My new home”, immediately reminds me of a line from the birthday party’s song “Deep in the woods”, as Nick cave declares that “Tonight we sleep in separate ditches”. There is, of course, no other resemblance to that band, as Djinn and Kadaver focus on the more extreme, painful and hateful side of music. The haunting, distressing monologue in the beginning of the album asks the listener to relax, among other descriptions and instructions. Relax, relax, deeper and deeper. Following this plea is a sharp painful electronic shriek that destroys any sense of relaxation that might have been induced by the eerie voice. When it ends, the album goes on a slow, decaying and sickening ride through cohesive dark sounds. It is interesting to hear Kadaver, who usually stays with the insanely violent ear piercing audio destruction, replacing the sharp spears of sounds with endless sea of dust and debris. Djinn fits to this world perfectly and as the album progresses it’s difficult to decide who is leading who in this danse macabre. Together they form a hopeless, barren world, drawn from their death-addicted point of view, and it’s a sorrowful, painful journey. Anti Human life offers no hope, remorse or future, only the inhuman darkness that clings to this sort of music like alien fungus, ready to spit it’s spores on the unsuspecting listener.